If you’re trying to choose the Koi for your Koi pond, you probably have quickly realized that there are many different species to choose from. If you are looking for some very colorful fish, you may want to consider going with the Ochiba Koi. These Koi are known as one of the more colorful options available to you. These lovely fish come with a lovely gray blue color, markings in brown, and they have the well known net like pattern on them as well. The Ochiba Koi have actually been specifically bred to achieve these lovely color patterns. Koi are part of the carp family, which happen to be brown. However, among Koi, many varieties can be found. The Ochiba Koi is only one of the options and it has beautiful fins and metallic scales that grab the attention. Within the varieties of Koi, they are all distinguished by their scales, colors, and the patterns on them. Some of the main colors you’ll find among the Koi include cream, white, black, red, blue, and yellow. Usually there is some combination of these colors found, and most breeders today are trying to come up with the most attractive and colorful Koi possible. Among the more colorful options are the incredible Ochiba Koi, which have been experimented with for years. The Ochiba Koi actually are a part of the Kawarimono group. 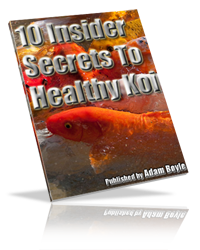 This group is a classification that is quite broad, including most of the Koi that are not included in the other classes out there. Chagoi and Soragoi Koi are crossbred together to get the lovely Ochiba Koi. The Chagoi is a brown colored Koi and the Soragoi is a Koi that is grey blue in color. While both of the fish are a bit plain in color, when they are combined together, they make the incredibly striking Ochiba Koi, which has become a more popular option among those that breed the Koi. If you take a look at the Ochiba Koi females, you’ll find that they have pectoral fins that are very small as well as a larger belly. They also end up swimming with a sideways motion. They are happy with humans nearby and they even may begin to feed right from the hand of the owners. While the males have a body that is shaped like a torpedo and streamlined, the females have a bit of narrowing right before the tail. It is definitely important that you take good care of your Ochiba Koi if you decide to add them to your Koi pond. Taking care of them can help you ensure they live a long time, since they are known to live more than 20 years. These fish do well in waters that are cooler. When the cooler weather comes along and it gets cold, they usually will slow their metabolism and go into a hibernation period. 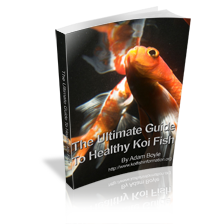 In order to keep your fish nice, make sure you carefully assess the needs of your Ochiba Koi. Ensure you have a pond that is large enough and deep enough for them. It’s usually good to go with a pond that has a minimum of 1000 gallons of water. The water should be a minimum of three feet deep as well. If you don’t build a pond large enough, you will have a hard time adding more Koi and keeping the Koi you have healthy. As you can see, the Ochiba Koi are definitely a great addition to your Koi pond. They will add some lovely colors to your pond and they look great with many other colorful types of Koi as well.